Ask almost anyone and they’ll tell you that Geneva is an expensive place to shop. But it doesn’t have to be, so if you consult our guide on the best second-hand shops and flea markets, you can pick up some great new gear for reasonable prices. A rare sight indeed, Downtown is one of the few stores in Geneva featuring second-hand items for men. Gucci, Burberry, Smalto, and Hermes are just a few of the brands featured in the store. Both Downtown and its sister store Uptown pride themselves on their ethical and environmental footprint, providing clothing that’s fair trade and exploitation free. 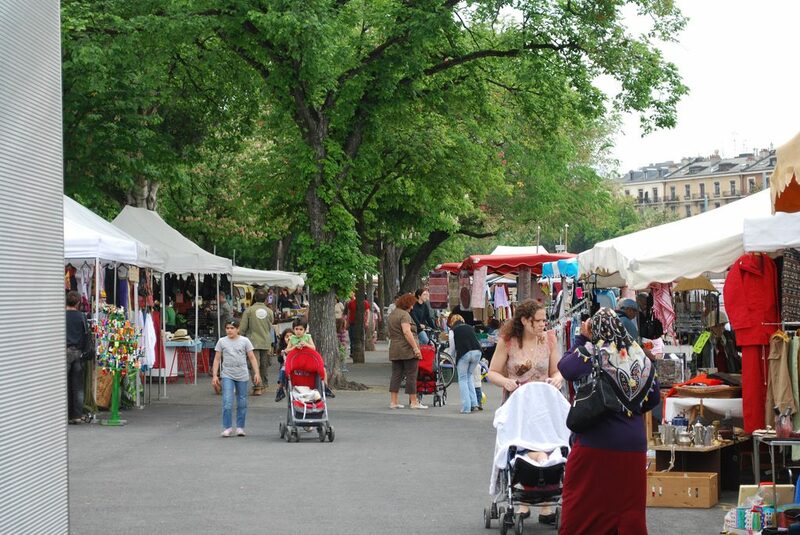 Geneva’s biggest flea market is a hotspot for bargains. The streets along the sprawling Plainpalais Square are lined with stalls packed with bric-a-brac, second hand clothing and the odd antique piece of furniture. Towards the university on the opposite side of the tram tracks is where you’ll find vintage clothing and other wearable items. The market is held twice a week, on Wednesdays and Saturdays and always attracts large crowds, so be sure to head along early to snap up the good stuff. Flair No. 3 is owned by Marisa, a lover of fashion and the style of Audrey Hepburn who grew up making her own clothes in Angola. The previously loved designer items and accessories that you’ll find there have been touched up or remodelled by Marisa herself, giving them a truly unique touch. Marisa herself is often on hand in the store to give you a real personalised shopping experience. Second-hand doesn’t mean cheap in Geneva and that’s true at Numero 6. Owner Jean Marc David collects designer items from the finest fashionistas in Geneva and sells them on. If you’re in the market for cut-down prices on high-end clothing, it may not be the best place to look, but it’s a prime spot for a bit of wishful window shopping. Who knows, you may just snap up a bargain. Every Tuesday and Friday, the Marché de la Fusterie just off Rue de la Croix d’Or is invaded by book sellers. Books of every genre are found on the 10 plus stalls and there are a few old paintings or sketches of Genevan landmarks at a few of them. While most of the books are in French, there is always a good selection in English. An extended browse of the stalls is highly recommended to uncover some aged gems that are often hiding among the fiction. Run by the local Geneva Red Cross, the three Vêt’Shop’s (in Carouge, Eaux-vives and Etuves) are a great place to pick up bargain clothes and contribute directly to a good cause. Clothes are donated by the population of Geneva and other clothes stores, ensuring that there is an eclectic mix of vintage outfits, brands and general wear.